The highly topical problems of radioprotection will be treated in the following issues of "Experientia" by competent experts in this field. 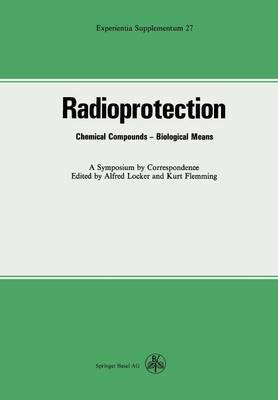 Before printing the papers have been exchanged among the authors to allow them for commenting upon the articles so that a Symposium by Correspondence on Radioprotective Means and Compounds arose. As organizers and editors of this symposium acted A. LOCKER (Vienna) and K. FLEMMING (Freiburg, Br. ). Contents 9 J. D. Chapman and A. P. Reuvers: The Time-Scale of Radioprotection in Mammalian Cells 19 J. Calkins: General Patterns of DNA Repair and their possible Signif- icance as Necessary Protection from Environmental Radiation Exposure 31 S. Homsey: Protection by Hypoxia and the Effect of Low Oxygen Tensions on Radiosensitivity 45 L. Revesz and B. Littbrand: Radioprotection by Radiosensitizers 53 T. Sugahara, M. Horikawa, M. H. Ikita and N. Nagata: Studies on a Sulfhydryl Radioprotector of Low Toxicity 63 J. M. Yuhas: Systemic Factors Affecting the Radioprotective Effec- tiveness of Phosphorothioates 71 C. Streffer: Studies on the Mechanism of 5-Hydroxytryptamine in Radioprotection of Mammals 79 K. Flemming: Some Ideas Concerning the Mode of Action of Radio- protective Agents 87 A. Locker and K. Flemming: Some General Aspects of Radioprotection (A Summary) 9 The Time-Scale of Radioprotection in Mammalian Cells J. D. Chapman* and A. P.